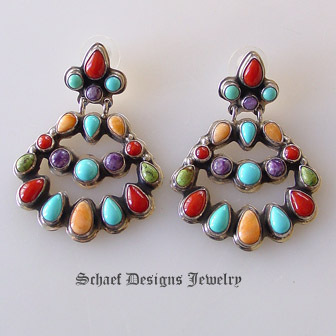 Gorgeous Native American artist signed chandelier post earrings of turquoise, charorite, coral, gaspeite and spiny oyster shell will go with just about everything. These beauties are large enough to be seen even if you have long hair and the craftsmanship is incredible. A real asset to any jewelry collection. Earrings measure 2 1/4 inches from top to bottom by 1 5/8 inches at the widest point.